Who could have guessed 20 years ago that Rock and Roll Hall Of Fame guitarist Ritchie Blackmore would find love and happiness as a front man for a Renaissance/Rock fusion band, but here we are two decades later. 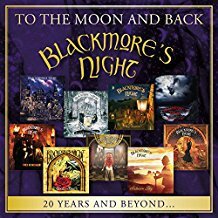 He and partner Candice Night are celebrating the 20th anniversary of Blackmore’s Night with a 2-disc release titled To The Moon And Back: 20 Years And Beyond. The first disc is basically a compilation of their better known material. To my ear, the mix on some of the songs appears different. The sound level on Blackmore’s acoustic work on the mandolin and guitar has been turned up and it shares equal billing with Night’s vocals. It allows the listener to hear just how intricate many of the songs are and how good a guitarist Blackmore is when everything is stripped to basics. There is also a 9 minute version of “Home Again’ that presents the band at its best. Disc two moves in a number of directions. They have re-imagined a number of their classic songs and “Writing On The Wall,” “Coming Home,” and particularly the bonus track “I Surrender” emerge as hard rock classics. They are more akin to Blackmore’s work with Rainbow with a female vocalist. While they are outside the usual norm for Blackmore’s Night; they are an interesting turn for the band. Disc one is a fine introduction to their sound, while the second disc hints at possibly new directions. Blackmore’s Night has carved a unique niche for itself. To The Moon And Back: 20 Years And Beyond brings a period of their career to a close. Twenty years is a long journey in the world of music but it is one worth taking with the band. Who knew that when Ritchie Blackmore was the lead guitarist for hard rock bands Deep Purple and Rainbow, someday he would find contentment and love as a part of the rock/renaissance band Blackmore’s Night? But here he is 16 years and a dozen or so albums down the road. The band’s albums tend to have a flow to them. They have fused a modern rock sound with elements of renaissance music into a unique and many times brilliant mix. The band has not veered from that approach, so If you like one album; you will probably like them all. Their latest release, Dancer and the Moon,is except for two tracks mostly more of the same, which should please their ever-growing fan base. Blackmore’s Night has covered a number of songs by outside writers with varying results. Songs such as “Can’t Help Falling in Love” (Elvis), “First of May” (Bee Gees), “Diamonds and Rust” (Joan Baez), “The Times They Are A-Changin’” (Bob Dylan), and “Celluloid Heroes” (Kinks) have, for better or worse, graced their albums. This time they have recorded the best cover song of their career, Randy Newman’s “I Think It’s Going to Rain Today.” It is the album’s first track and one where the band veers from their usual approach. It is more of a pop song, since the group changes the song’s tempo, plus Candice Night’s vocals bring a polish to the track. Blackmore’s guitar play is sedated, which provides a subtle foundation for the performance. The second song that is outside the norm is the album’s last track, “Carry On…Jon.” It is one of the more poignant ones of Blackmore’s career, as it is an instrumental tribute to his old Deep Purple bandmate Jon Lord, who passed away last year. It is an extended guitar solo with a melancholy feel that is a fitting farewell to a person with whom he spent a lot of years. 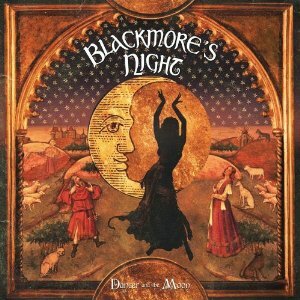 I tend to like Blackmore’s Night’s music and Dancer and the Moon is a satisfying release. They may or may not have some creative twists and turns in their future but for now, this album will do just fine. Candice Night met Ritchie Blackmore when she was a background singer. That chance meeting has evolved into a 15-year musical and romantic relationship. Now Blackmore’s wife, Night has been fronting the renaissance/rock group Blackmore’s Night since 1997. She is now stepping out of the band’s shadow to release the solo album, Reflections. This is first and foremost a Candice Night project. The album begins with a number of lyrics she had written but had not been set to music until now. Blackmore was busy with a project of his own, so she wrote the music herself. With her husband unavailable, it left Night free to explore territory of her choosing. While her Blackmore’s Night roots remain firmly in place, and at times influence some of the songs, she does branch out toward the pop/rock mainstream. Night has one of those voices that is a gift from God and it is on display here. In a group setting, that voice always shared the stage with Blackmore’s guitar play but now it occupies the center position without any constraints. Night has always been an excellent lyricist too. Her visions, sometimes mystical and surreal, are presented as her ethereal vocals bring them to life. The music travels in a number of directions – from country, to contemporary pop, to rock and roll. There is the catchy melody of the pop-oriented “Gone Gone Gone,” the electronically-driven dance track “Dangerous Smile,” the gentleness of “Wind Is Calling (Hush the Wind),” and the introspective “Alone with Fate,” and “In Time.” My only complaint is the constant use of keyboards, which make the strings of “Alone with Fate” a welcome relief. Candice Night has made it quite clear that Blackmore’s Night will remain her priority. Still, it’s good to see her take a chance and stretch out a bit. Reflections is a nice look into her creative spirit and soul. It should please her old fans and gain her some new ones as well. Article first published as Music Review: Blackmore’s Night – A Knight In York on Blogcritics. Ritchie Blackmore is celebrating his 15th year as a part of Blackmore’s Night, which is longer than he fronted Rainbow and approaching the length of time he spent as the lead guitarist of Deep Purple. Blackmore’s Night was formed during 1997 by Blackmore and vocalist/girlfriend (now wife) Candice Night. They developed a unique and creative sound by fusing Blackmore’s hard rock background with traditional renaissance music. While they have always been more popular in Europe and Japan than the United States, through constant touring and recording, they have steadily built a fan base in the USA. They performed at the York Opera House, September 30, 2011, and the result of that concert has now been released as a CD (and DVD). In addition to guitarist/mandolin player Blackmore and vocalist/woodwind player Night, they are supported by keyboardist David Baranowski, bassist/rhythm guitarist Mike Clemente, violinist Gypsy Rose, drummer Squire Malcolm of Lumley, and bagpipe player Minstrel Albert. It is a different type of concert than their first two DVD/CD live releases, Paris Moon and Castles and Dreams. Ten of the 14 tracks are from their last two albums, 2008’s Secret Voyage and 2010’s Autumn Sky, so there is little duplication of material and is a good complimentary disc. The only negative is that unlike the first two live releases, this one does not present the full concert as it has been edited down to 14 tracks and about 80 minutes worth of music (from a show that had over 20 tracks and was over two hours long). Still, what is here is a fine update on their sound and career. They rock a little more in places than in the past, which is due in part to their last release, Autumn Sky, which had a harder edge than their previous material. While they remain in touch with their renaissance roots, Blackmore’s guitar is more dominating on a number of tracks and some of the solos are a little longer than in the past. When Blackmore switches to the mandolin, it is a somewhat different story as it melds in with their older fusion of rock with renaissance music. His mandolin work is superb and presents a differerent side of his virtuosity as it is precise and the clarity of each note is emphasized. Night’s voice remains one of the better instruments on today’s music scene. The first few tracks cover a lot of territory. The Gregorian chant opening of “Locked Within the Crystal Ball” leads to some frenetic play by Blackmore with Night’s vocal floating over the top. “Gilded Cage” is gentle with Night’s voice the center of attention. “The Circle” is a show piece for an extended Blackmore solo. “Journeyman” covers the middle ground and is representative as to what their band is all about. An extended and building “Fires at Midnight,” the joyous “Toast to Tomorrow,” and the soothing and understated “Barbara Allen” are the heart of the CD and find the band and audience in their comfort zone. Many times they add a well-known cover song to their repertoire. In the past they have included such songs as Elvis Presley’s “Can’t Help Falling in Love” and The Kinks’ “Celluloid Heroes.” I may not have ended the CD with the Bee Gees’ “First of May” but as a stand-alone track it is a brilliant cover. A Knight in York brings the career of Blackmore’s Night up to date. It should appeal to their many fans and serve as a jumping off place for new admirers. Blackmore’s Night is now 11-plus years into their career. It began with a chance meeting between guitarist Ritchie Blackmore and vocalist Candace Night during 1989. Their paths crossed again in 1995 when she provided background vocals for a Rainbow album. By 1997 romance and a new group were in the making. They are basically a rock/renaissance group that has a unique sound. They have always been more popular in Europe than the United States but I caught their act in Raleigh, North Carolina a few years ago and it was one of the better concert experiences I have had in recent years. During their 11 years together they have released eight studio, two live, three compilation, and four DVD albums; all have been well written and produced. I have found them to be consistently excellent and if you like their eclectic brand of fusion, any of their albums would be a fine listening experience. Autumn Sky is their eighth studio album and for the most part it continues their tradition of modernizing renaissance stories and music in a rock vein. I say “for the most part” as there are a couple of tracks that almost depart from this style and move in a harder direction. Ritchie Blackmore is a terrific rock guitarist and his work is always welcome, but I appreciate Blackmore’s Night for a certain style and would prefer they remain within that concept. Regardless, if you are a fan of the group, there is a lot here to appreciate. “Vagabond” is a typical Blackmore’s Night track as it combines Night’s vocals of fantasy lyrics with a guitar, bell, and violin providing support. “Sake of the Song” is a raucous dancing and drinking track. “Strawberry Girl” is joyful, melodic and upbeat. The mournful melody of “Health to the Company” suits its wistful lyrics. And the instrumental “Night at Eggersberg” is a nice string piece. “Highland” and “Journeyman” both move very close to rock music as Blackmore takes several tasty solos. The only track that comes up short is the band’s cover of The Kinks “Celluloid Heroes.” For a renaissance-themed album, this ode to Hollywood is an odd choice. Autumn Sky fits in well with the past music by Blackmore’s Night. By this point in their career, the albums and music flow into one another well. If you are a fan of the band or have been looking for something a little different, then this is an album for you. Article first published as Music Review: Blackmore’s Night – Autumn Sky on Blogcritics. Blackmore’s Night was an under the radar group until last summer when I received free tickets for one of their concerts in North Carolina. At the end of their three hour performance, I was a fan, and began assembling their back catalogue. Ritchie Blackmore, hard rock guitarist of Deep Purple and Rainbow fame, and singer Candace Night, of blonde hair fame and possessor of one the purest voices in music, have combined in Blackmore’s Night to create a unique rock-renaissance sound – think of a rock band playing before Elizabeth I. The sound can be quirky and offbeat on occasion but can also be beautiful and stunning as well as interesting most of the time. Paris Moon is a DVD + CD set. The DVD is the heart of the set as it presents a Blackmore’s Night concert recorded at the Olympia Theatre in Paris. This is an entire concert and not a piecemeal, spliced approach that you get from too many artists’ concert releases. As such, this disc gives the viewer and listening an accurate picture of what the group is all about. Is the DVD as good as seeing them live? No. There is nothing like a live performance for almost any group, but this is still a better live release than most. Paris Moon comes with good packaging, clear sound and production, plus an informative booklet. Blackmore’s Night starts the concert rocking; “Past Times With Good Company” and Ian Anderson’s “Rainbow Blues” are Renaissance with attitude. Ritchie Blackmore proves he can still play the guitar after all these years. His acoustic work here and throughout the album is superior in many was to his present and past electric guitar work, as he shows a preciseness and deftness that is rarely seen. Candace Night established herself as a front woman with stage presence, and shows whether rock or ballad, she possesses one of the superior vocal instruments in music today. Blackmore’s Night concerts always feature audience interaction and participation. The band works hard not only to present their music but to enable the audience to be an intimate part of the concert experience, too. Blackmore and Night play off of each other well; not only is their male-female dynamic interesting but there is also a dark-light, energetic-quiet dynamic at work. Ritchie Blackmore stays mostly in the background and rarely speaks, and is wise enough to let Knight shine up front. The times that he does step forward for extended guitar solos, however, there is no question of who is dominating the spotlight. The accompanying CD covers no new ground as it presents material from their past ten years, bringing the first ten years of their existence to a close. If, however, you have not been exposed to Blackmore’s Night in the past, this album can be a good introduction to their studio material. Paris Moon is a good introduction to the musical and concert style of one of the more innovative groups in music today. This set will hopefully leave you wanting more and going to see them in concert if they happen to pass your way. If I had not seen them live myself, I probably would have given this release a straight A, but as such, it gets a shade lower. Ritchie Blackmore and Candice Night have returned to take their fans on a Secret Voyage of wonder, imagery and mystery.Blackmore’s Night has now passed the ten year mark in their history as a group. I am actually amazed that Blackmore has remained committed to this project given his history, but Night’s allure may prove that even an old rocker like him can be bewitched. Secret Voyage breaks no new musical ground. They continues to produce their fusion of rock ‘n’ roll and renaissance music. Their sound remains unique and Blackmore’s night is extremely popular is Europe and Asia. In The United States, they have a small but rabid following. Secret Voyage topped Billboard Magazine’s New Age Album Chart so they have now officially moved into Enya territory.The album continues the group’s history of rotating ballads and up-tempo dance party songs. Throw in a old Rainbow song and add some classic rock, in this case an Elvis Presley tune, and you have a typical Blackmore’s Night album. They have found a successful formula of creating a mood and transferring it to their listeners. Blackmore’s prowess on the guitar and other stringed instruments and Night’s charisma and ethereal vocals combine to make their music memorable.The beginning of Secret Voyage presents them in microcosm. “God Save The Keg” is an instrumental overture with brass and strings augmenting their renaissance sound. It is wonderful background music and serves the purpose of calling the faithful. “Locked Within The Crystal Ball” is the first step on the journey. This eight minute opus is a mystic journey filled with imagery and wonderful performances. “Toast To Tomorrow” is a typical Blackmore’s Night party song that asks the listeners to hoist a few in celebration. Ritchie Blackmore proves he still has his guitar chops with a cover of the old Rainbow song, “Rainbow Eyes.” “Prince Waldecks Galliard” is an instrumental that finds Blackmore just with his trusty acoustic guitar. “The Circle” encompasses all that is good about them. It combines ancient mythology and fantasy but is accessible and will no doubt be presented as an interactive dance and party song in concert. The only real miss on the album is Elvis’ “Can’t Help Falling In Love.” Candice Nights voice is made for this song but somehow they stray from the original and not in a good way. Blackmore turns up the guitar volume, but worse, they increase the tempo and present it as a full rock song with less than stellar results.Blackmore’s Night has found a niche in the music world which it fills well. Their base continues to expand as new fans find or encounter them. It is doubtful if Blackmore’s Night will ever change or evolve which is fine as they cover the old ground so well. You are currently browsing the archives for the Blackmore’s Night category.